We decide to drive to the top of Sulawesi, Manado and visit the Togean Islands on the way back down. It is a mammoth 750 miles from Ampana to Manado. On route we stop at a Toyota garage in Poso, where we have the tracking realigned. It was probably knocked out around 600miles ago and so badly that our front tyres are nearly bald. Unfortunately the garage does not have the right equipment and their manual adjustments do not seem to do the trick. We don’t have much choice but to continue to the next main town on our route and find a garage with the right equipment. We plan to stop in Marisa, a 437 mile drive from Ampana, (Gorontalo at 510 miles is a little too far) driving for miles along a fantastic coastal road popping in and out of tiny villages with kids playing on the beaches. It soon becomes dark but there is no accommodation for miles and miles so just keep driving until we finally find a roadside hotel on the outskirts of town at 11pm. In the morning Martin checks on the tyres, which are now even more worn than yesterday so decide to drive to Gorontalo, and have the tracking sorted out there. 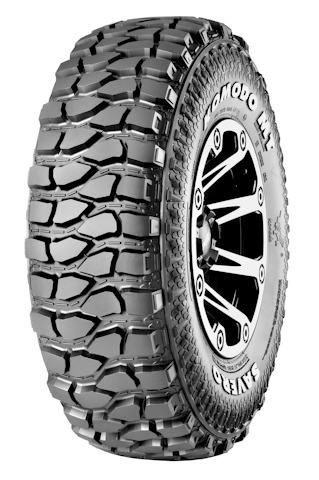 Also it’s now time for a full set of tyres, we just need to find a BF Goodrich reseller…. The drive into town is slow; we think we have arrived at the main town and ask local police where the nearest Toyota is. They helpfully get someone to jump on a bike and take us to a small garage; they are unable to help but suggest rotating the tyres. Next we are taken to a small puncture repair shop, where miscommunication causes all sorts of issues; the guy thinks we have a flat and prepares to take the tyre off the wheel. At this point, Martin tells them to stop and re-inflate the tyre. They catch on that we want to rotate the tyres but their plan to use a tree stump to rest the middle of the car on while the jack is being used on the sides, takes us by surprise, and before I know it Martin has the tyres back on again and is ready to get out of there! Suddenly we have an audience, a crowd of people around the car, young boys, old ladies and mums with their babies appearing unexpectedly out of nowhere! Just as we are about to leave, a policeman asks to see our passports, visas and driving licence, and we begin to think stopping wasn’t such a good idea after all! With everyone still crowded around the car, the policeman checks our visa dates then demands our telephone number, finally we go after about twenty minutes. We find this all a bit strange and as expected a few minutes later, get a call from the policeman with a lot of questions about who we are, where we come from, where we are going, so I eventually make excuses and say we have to continue driving! After all this, on checking the GPS again, we discover we are still a few miles off from the main town and had stopped in completely the wrong place! Once in Gorontalo, we find Toyota, only to discover that it is a half day today and they are closing up. Instead, we try to get the wheel alignment fixed at two different local places. Some friendly locals let us follow them in their car all the way, but it seems their machines are broken. We decide to wait until Monday morning for Toyota. The search for cheap accommodation is in vain, they are all out of our budget. However, we chance on the backpackers choice, Melati hotel, and find some reasonable accommodation, which surprisingly has free Wi-Fi too. Martin gets the wheel alignment fixed at Toyota, which takes up half the day. While at the hotel, he searches for BFG suppliers, coming across the website of GT Radial, who manufacture similar off road tyres. On the off chance he emails them a sponsorship proposal, in the hope they respond, although not many actually do. To our surprise later that evening Martin has a call back, and they do want to sponsor us! It’s great news, just when it’s really needed, given our current tyre situation. A few more calls and emails and everything is agreed; we find GT Radial to be fantastic to work with, and very responsive to all our questions. They recommend we try out their new line of Savero Komodo tyres, which look great, and prepare to have them sent to us in Manado . We are ecstatic with the partnership and look forward to using their tyres throughout the rest of our trip through Australia and from South to North America! 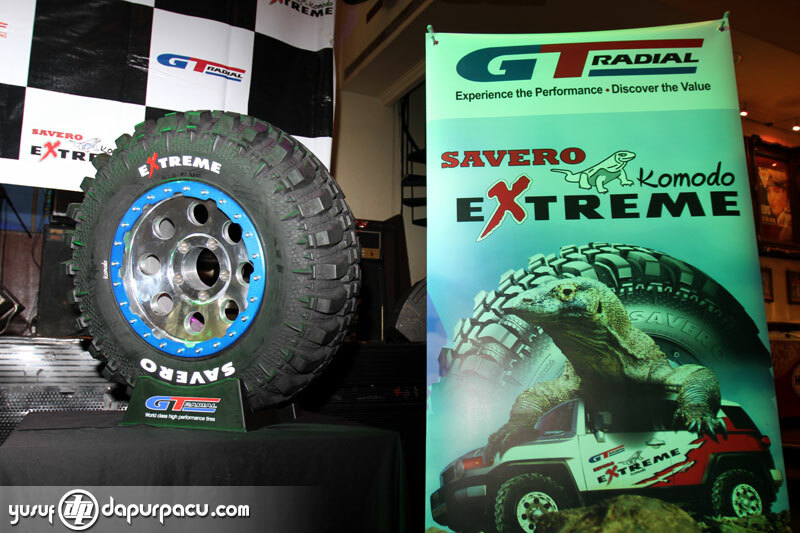 GT Radial is the largest integrated tyre manufacturer in Southeast Asia, producing and distributing high quality tyres for passenger cars, SUV’s, commercial, off-the-road, industrial and motorcycles. They have recently released a fantastic new range of tyres called the Savero Komodo, which come as a MT or an Extreme version shown below. We leave early for Manado, the drive taking around 8 hours (250 miles). Once in town, its traffic jams galore, hundreds of mikrolet, blue public transport minivans, and there’s also a headache-inducing one-way system which manages to keep us going around in circles for a while, passing huge shopping malls and hotels. Again we have problems finding accommodation, everything is full! We eventually settle on Celebes hotel, one of the better rooms with sea views and Wi-Fi. We have a rest day in Manado later getting into a mikrolet to avoid driving in the centre; it has no less than ten speakers on its tiny roof and is blasting out R&B music so loudly that the whole thing perpetually shakes throughout the journey! We are picked up from our hotel and walk 5 minutes to the port area, there is a slightly crazed looking man following us, shouting and with some sort of bar in his hand, so I slow down to let him pass, at which point he then also slows down. Luckily the boat is not far so try to ignore him and walk as calmly as possible, making it in one piece to the water’s edge, with more manic shouting behind us! He is very scary! We clamber over several boats to get to ours, a small wooden speedboat. Leaving the port we have great views of the surrounding smoking volcanoes and the Manado coast line. The boat gets us to Bunaken Beach Resort on the tiny island of Bunaken in just over forty minutes (after waiting half an hour for the boatman, apparently he had a doctor’s appointment!) As we have arrived at low tide, we are given some boots to wade through the grassy water, with bright orange, red and blue starfish which are scattered over the seabed. Pulau Bunaken is part of the Bunaken Manado Tua Marine National Park. It is surrounded by coral reefs, deep water and nutrient filled currents, making it one of the best places in the world for diving. The resort is quite secluded, bungalows set around a picturesque garden with the beach on our doorstep, it feels like we are the only ones here, although there is a string of accommodation along the eastern shore. We have arrived just in time for lunch; all three meals are included in the price of the resort, as there aren’t any restaurants on the island. We meet some of the other guests as there aren’t too many staying, and chat over a tasty dinner of rice with a sweet and sour fish dish with mixed salad. Martin disappears for two hours, coming back and describing how fantastic the snorkelling is, in both directions out from the beach there is a coral reef which drops vertically down from 5m to 40m. We wake up to find a humungous spider, its body nearly the size of a golf ball on the ceiling above our heads! Neither of us wants to attempt to move it, so we ask a staff member, who gets a broom and lets it out into the garden, hope we don’t get another visit! Today we have two dives, the first of which is at the site known as Lekuen III. It’s just us and a couple of others on the boat which is good; it takes a few minutes to get to the dive site, equipment on and in the water. The underwater landscape is that of a sandy bottom with outcroppings, which then drastically changes to a wall dropping 200m plus. We spot shoals of snapper, numerous nudibranchs, and a pool of hundreds of fish which suddenly dart up the wall as a larger fish gives chase. There are also lots of lobster hiding in the coral, tentacles sticking out into the water and our dive master points out miniscule crabs hidden within the corals. After an hour’s rest on the boat, it is time for dive two, at Muka Kampung. This site has a steep drop off with a sandy sloping path on the tip of the reef. We see at least five turtles, one giant one, which lifts its head up to inspect for a minute as we pass, then nonchalantly puts it down again! Another monster sized one is sitting in a rocky outcrop, with two cleaner fish attached to it. Another literally swims above our heads as it leaves its enclave. A huge red Fire fish is sitting perfectly still under an outcrop, long flowing gills fluttering in the current. The site is fascinating, hardly any current, and a huge wall of coral which drops into an abyss, caves and valleys filled with giant trevally, butterfly fish, clown fish, lion fish. Lunch is some delicious barbecued barracuda with rice, salad and pasta. Deciding to go for a snorkel, we pick up our gear from the boat and head out over the reef, a shallow reef with a carpet of coral and fish gives way to deeper water and a wall with a sharp drop off. We spot strange red fish with exposed razor sharp teeth, fat puffer fish, angel fish, miniature fluorescent fish which simultaneously hide in the coral when you move too close, clams which snap shut with the proximity of our hands, a turtle swimming to the surface and even find Nemo! As we swim back in, the water is boiling hot, who needs hot showers anyway when you have this instead! Martin has two dives today and I go along with the boat to snorkel. The first site is at Siladen Point just off Siladen Island, another steep wall with soft coral. Martin sees three turtles and a shark while diving. The second site is at Sachiko point, named after a Japanese tour operator. I swim out from the boat; there are literally hundreds of purple trigger fish from the bottom to the surface, and there’s near perfect visibility with the sun shining through the water. The water on top of the reef is deep, at least 15m, then gradually gets shallower, leading to grammar phone shaped corals, and bright sponges, multicoloured hues, teeming with fish. I spot anemones, a huge catfish with two smaller fish attached to its body, a big leopard spotted fish, tiger fish, clown fish, zebra patterned fish, and a school of pipefish perfectly still, like long steel blades only with eyes, on the sandy bottom. Martin’s second dive is fantastic, with schooling barracuda, another shark and several turtles. Although most people come to the island to dive, the snorkelling is just as good. I suddenly spot Martin and the other divers down below me just beyond the drop-off from the reef. I follow them along the reef to where the boat picks us all up. Later we go for another snorkel just from the beach in front of the resort, swimming in both directions from the resort for a couple of hours, along the edge of the reef. In the morning, the boat speeds us back to the mainland and we walk back to the hotel to find the car intact. We decide to go up to the nature reserve on the other side of the peninsula taking us through narrow and quiet curving mountain roads. Once at the main town of Batuputih, we stop at the first losmen we see, but the place seems deserted. A lady eventually appears to show us a room and although it’s nice, it is a bit over budget and isolated, so we carry on down to LP recommended Mama Roos, to find a dark and uninviting room. Just a few metres down the road is Tarsius homestay; it’s basic but a lot nicer, and includes three meals in the price. The owner of Tarsius is very friendly and knowledgeable, he even worked with the BBC for three months while they were filming in the forest. After the huge lunch, we get ready for the hike, smothering ourselves in insect repellent as we had read that the forest is home to lots of midges which leave a nasty bite that itches for two days. Driving over a rickety bridge with broken planks which the car barely fits on, we come to the park entrance, paying 85,000Rp each and meet our guide, Renny. The bumpy dirt track continues for another couple of kilometres before the start of the trekking path. The reserve is surrounded by deserted beaches and coral gardens and is home to several rare creatures, a couple of which we hope to get a glimpse of! The forest is noisy with the sounds of locusts and there are trees with monstrous sized roots spread along the forest floor. After 40 minutes of walking, we arrive at the hornbills nest but there is no sight of it, we wait patiently for an hour as the sun sets but it’s getting late so we carry on into the forest. Staring back at us from the low branches of a tree is one tarsier, then another and another, and finally a baby appears. Tarsiers are the smallest primates in the world, and nocturnal, found only in some rainforests of northern Sulawesi and the Philippines. They are very cute, about 10 to 15cm long with big round black eyes, (which are as big as their brains) long tails and brown fur, really not too dissimilar to a gremlin! A few minutes later, they start jumping from tree to tree, in search of a dinner of insects, which they will do all night. Walking back through the forest in the pitch black, although we do have torches with us, we arrive at the car and walk to the tarantula tree! We wait for a while in the darkness in front of the large hole in the tree; the gargantuan grey-black tarantula emerges, one leg at a time… but there is too much light being shone on it and it quickly retreats. Another ten minutes in the darkness and it is out again, this time staying long enough for pictures, huge pincers and fat body in full view. Later Renny invites us to the local church to ingrate with the local people; there is a music competition tonight, with solo performers and groups, which she also takes part in and is really good! It seems most of the town is here tonight, surrounding the large tents and watching the show. The people in the village make us feel welcome and at home; they also appear to have a very strong community built around their church, which we really do not have in the west anymore. We wake at 4.30 to meet Renny at 5am. Still pitch black, we head back down the bumpy dirt track, and head straight for the Red-knobbed hornbills nest. It is found only in Sulawesi and the neighbouring islands, including Lembeh. It is breeding season so the female stays within the tree by the nest whilst the male leaves to gather food, so we wait for his arrival. Even this early in the morning, the forest is hot and sticky. After half an hour of patiently waiting, we hear the impressive sound of the hornbill before we see it, attributed to the loud rushing sound produced by each wing-beat. It lands at the nest to feed the female, releasing the fruits from its mouth. It is about a metre tall with a long yellow beak and a red crest with a huge wingspan. It stays for a few minutes, then flies off into the canopy. The route to the Crested Black Macaques is a bit trickier, no forest path to follow, just trekking through the undergrowth, down steep embankments, over fallen branches, and overgrown plants and trees, about forty minutes later we are surprised to be back at the car. They are listed as critically endangered due to increased clearing of the rainforest and hunting. Renny gets a phone call from another guide who had gone ahead to say that the troupe of monkeys had now moved to the beach. We drive a bit further and trek for another half an hour to the beach, to find a group of at least 15 macaques frolicking on the black sands and in the rain-forest trees. They have very long faces and look on at us inquisitively for a few seconds subsequently paying us no attention. Most seem placid, but a few are fighting, mouths open and pointed teeth exposed. A couple of the babies are swinging on branches and falling off. We follow them around the path taking pictures. The locals all seem amazed by the car and explain we are the first foreign car they have ever seen to enter the park. We drive back to Manado to get the tyres changed at Maju Ban, the GT Radial distributor. They are very helpful, fix our light and even give our car a wash. With new tyres, we head the 250 miles back towards Gortantalo. Next stop, the Togean Islands! Hi , thank you for your story about Sulawesi , we went there 10 years ago – to Dongarla on the sea, hiked for 8 days in rainforest near Poso and stayed on the large fresh water lake Tentena. We had wonderful hospitality, generous locals, an interesting drive south along the west coast past large prahu boats. We live in Bulli north of Wollongong, Australia. Very happy to hear of adventures around Sulawesi and the rest of the magical country of Indonesia. any plan to come back again?